As China goes around claiming vast swaths of territory based on controversial claims, more and more confrontations are going to occur in the waters of Asia. 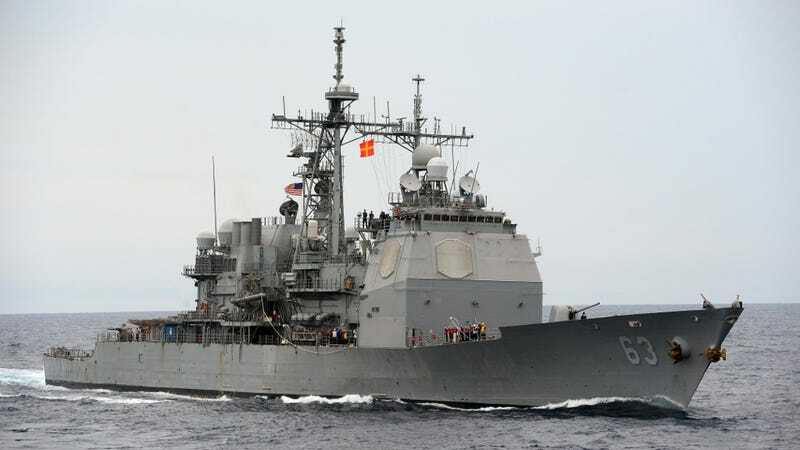 A fairly serious one occurred just a few weeks ago, when a Chinese naval ship decided to turn in its tracks right in front of the USS Cowpens. Details are still murky over exactly what happened, but like everything involving international relations we have to start way back to provide some context over what's happening. As China's national ambitions have grown, so have its territorial claims. While a lot of noise has been made about China's new air defense identification zone over islands administered by Japan, China has also quietly been staking a claim to virtually the entire South China Sea, which, weirdly enough, isn't actually very close to China. It's smack dab in the middle of the Philippines and Vietnam, and it's bordered to the south by countries like Indonesia and Malaysia. Naturally all of these countries claim some sort of rights to the South China Sea, then, but China has decided unilaterally based on some ancient maps that the South China Sea now belongs to China, thankyouverymuch, along with all of the natural resources that potentially lie below it. The New York Times actually did a fantastic job explaining the whole situation, and it's well worth a read if you have like nine hours or so. The other piece of the puzzle leading up to this whole little shindig is the Chinese aircraft carrier Liaoning. The Liaoning started out in life as a not entirely-completed Soviet aircraft carrier, but the Soviet Union collapsed and it just sort of sat there, parked on Ukraine's coast. Ukraine didn't really want or need an aircraft carrier, so they tried to get rid of it for years while it the carrier rusted. In 1998, the carrier was sold to a random Chinese company called Chong Lot Travel Agency for about $20 million. Chong Lot claimed they were going to turn the aircraft carrier into a hotel and casino, because that makes a lot of sense, and the fact that their chairman was a former career officer with the People's Liberation Army of China was totally not a factor, don't look over here guys. In 2001 it was towed to China, where nothing seemed to happen for a while. Then in 2005 the carrier moved to a drydock in Dalian, where it was covered in red primer, which is normal if you're going to be converting a hulk into a casino, I suppose, and China attempted to negotiate an order for 50 Su-33 naval fighter jets, which is most definitely not normal if you're building a casino. I dunno, I stayed in the Luxor this one time, didn't see any Russian fighter jets, but that's just me. The old Soviet aircraft carrier was soon re-named the Liaoning, and China was all "what hotel and casino?" and everyone else was just like "sigh, China, SIGH." Of course old rusted-out Soviet hulks take a bit of time to make new again, so it's taken until now for the Liaoning to go on its first training runs. And where did China decide to send it on one of its very first training missions? You guessed it: the South China Sea. You can also probably guess where this is going. On December 5th, the Liaoning was being escorted by a few other ships in the South China sea conducting maneuvers, all the while being shadowed and observed by the US Navy cruiser USS Cowpens. It's all fairly standard procedure for most navies, and, let's be honest, the Cowpens may have been toeing the line between observation and outright spying. Either way, the Chinese seemed to have gotten pretty pissed about it. A Chinese amphibious transport dock (likely a Type 071) broke off from the rest of the group, crossed in front of the Cowpens, and came to a dead halt. Despite warnings from the American ship, the Chinese ship refused to budge, and the Cowpens came within 500 yards of colliding with the other boat after the Captain ordered an all-stop. If you're not familiar with big ships, that's really pants-wettingly close. During the encounter, bridge-to-bridge radio communications were maintained between the American and Chinese commanders. "Communications were professional," the second official said. Eventually the strange staredown ended without further incident, but it's important to note that Vice President Joe Biden went to China last week, and he probably didn't just talk about puppies. But hey, while we're on the topic of CNN, why don't we ask whether or not you think this is a good thing, or a bad thing? Don't leave your opinion in the comments below, because it doesn't really matter and holy crap this is such a complex issue why does anybody ever even ask that?? ?